Most English cathedrals and a few of the more liberally endowed colleges at Oxford and Cambridge have always made provision for the singing of daily choral services by a professional choir. During their time in the choir, both the boys and the men usually develop not only a high standard of training and performance, but also a lasting love of liturgical music. Although boys’ voices often break about the time they leave the choir, many continue to sing treble for some time; and although cathedral men can usually sing on for as many years as they please, choral scholars are limited to their three-year span. A former chorister or choral scholar may join a church choir, but he rarely has another opportunity to sing daily choral services. It was to provide this opportunity that the Festival was founded. Edington was an obvious place to hold the Festival. Quite apart from the attraction of a holiday in the country, Edington Priory Church had been founded and built with the primary intention that daily choral services should be sung there. In holding the Festival there a tradition which had been lost was revived. The first Festival was held in August 1956. Parishioners generously housed the singers, and The George provided them with food. Rehearsals were held in the church in the mornings, expeditions made into the countryside in the afternoons, and services sung in the evenings. So successful was the first Festival that it was decided to hold one each year. The Festival, however, has not been allowed to remain static. In the earliest years services were sung from Tuesday to Friday; now they are sung from Monday to Sunday. This has been done so that the celebration of the Solemn Eucharist, which forms the climax of the Festival, may be sung on the Lord’s Day. The size of the choir has gradually been increased. The number of cathedral and collegiate choirs represented at Edington has also been increased. The music has come to be chosen in such a way that as many different schools and styles of composition are represented as possible, and with such emphasis as is appropriate to their importance. Old compositions, worthy of a place in the cathedral repertory, have been revived. New compositions have been written for the Festival. Several of these compositions, old and new, are now sung in cathedrals and collegiate churches. Services are now, with one exception, sung only at Edington. Although in the earliest years services were also sung at West Lavington and Heytesbury, it has gradually come to be felt that Edington was so eminently suited to this form of worship, that, with the exception of a visit to the magnificent church of Steeple Ashton, it was a mistake to stray away from Edington. The choral music is now chosen solely from that music which has been written for the English liturgy. 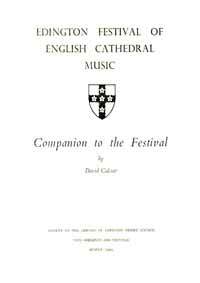 Apart from its greater propriety in an English church, it has come to be felt that it is wrong to sing the compositions of foreign composers or the compositions of English composers which were not intended for liturgical use or even for use in church at all, when English liturgical music continues as a national and ecclesiastical heritage which is still largely unknown. It has become increasingly evident in the four years since the first Festival that there are others besides the singers who derive pleasure, not to say inspiration, from the services. Congregations, which have gradually grown until capacity was reached last year, have come to learn not only of the matchless beauty of the music, but also, in some cases, of the very existence of the choral tradition of cathedrals and collegiate chapels. The maintenance of daily choral services in cathedrals and colleges is an expensive business; and, in an age when the Church is in acute financial difficulties, there are many who would gladly sweep away this tradition. Recently, however, the Archbishop of York, Dr. Ramsay, said that of all the proposed economics in the life of the Church the most monstrous and outrageous he had ever heard breathed was the suggestion that for the sake of economy cathedral choral daily services should be abolished. By increasing the number who understand and appreciate, and who therefore recognise the importance of preserving the choral tradition, the Festival has been able to make some small contribution to the great cause of cathedral music. A clear distinction should be drawn between the functions of the cathedral service and those of the parish church service, between the functions of the cathedral choir and those of the parish church choir, and between the purpose of cathedral music and that of parish church music. The daily recitation of the offices – the opus Dei – is the primary duty of the cathedral; the primary duty of the parish church is to lead the parish nearer to God. The daily singing of the offices is the primary duty of the cathedral choir; the primary duty of the parish church choir is to lead the worship of the congregation. The beautifying of the daily offices is the primary purpose of cathedral music; the primary purpose of parish church music is to help the congregation to worship. Thus, whereas the cathedral is not primarily concerned with the congregation, the parish church is only so concerned. Although a change in the times has lead cathedral authorities to provide a hymn at the end of the service, in which all are invited to join, this has not been done with the idea of encouraging congregations to join in the remainder of the service other than silently. It is as out of place for the congregation to join in the singing of the psalms in a cathedral, as it is for an audience to whistle the tune which the orchestra is playing in a concert hall. Cathedral and collegiate authorities have from very early times assumed the financial burden of the education of their choristers in return for the use of their voices; and many of the cathedral choir schools rank amongst the oldest educational establishments in the country. Some of these have retained their purely choral character; others have been incorporated into the Grammar School; and others have transformed themselves into some of the most efficient preparatory schools in the country, in which only a minority of the boys in the school sing in the choir. It is from this third group that the boys who are singing at Edington this year are drawn. Several of them are already at their public schools, several begin there next term, and the others have up to a year to go at their choir schools. Many of them have achieved pride of place in their choirs, and many of them have won scholarships for themselves to their public schools. It is one of the remarkable features of the Festival that the boys who have just completed a long summer term singing daily choral services, and who are just about to embark on an equally long winter term, should not only be willing to sing for a week during their holidays, but should be anxious to do so year after year so long as their treble voices hold out. The advantages which a boy gains from singing in a cathedral or collegiate choir are not as widely known as they should be. All that is required of a chorister-to-be is a good ear, a passable voice and an alert intelligence. In the course of his five-year span he gradually acquires a true sense of companionship in working with others at something worthwhile, a sense of public responsibility on a matter of national importance, a sense of leadership, a standard of workmanship, which is otherwise only expected of an adult, a power of concentration, which stands him in good stead for the rest of his life, an appreciation of beautiful things, a proper and healthy regard for tradition, and, above all, the Christian Faith; and yet for all this, he remains in every sense a boy. A chorister’s academic education in a choir school of the preparatory school character differs little from the academic education of a boy in an ordinary preparatory school. Undoubtedly the chorister leads a busier life than his non-singing brother; but his life is so arranged that his musical duties are carefully fitted into his daily round of school-work, games and free-time. Choir schools are required, just like other preparatory schools, to satisfy the requirements of the Ministry of Education. Choristers take the common entrance examination to the public schools, and many win for themselves either open music scholarships or scholarships awarded by certain public schools to choristers from certain choir schools. It is noteworthy that in the country’s recent educational legislation, the authorities are anxious that the choir schools should continue to make the special contribution to the educational facilities of the nation. Cathedral and collegiate authorities have also always made provision for professional singing men. The difficulties of securing suitable singers today arise out of the economic and social conditions of our time. The singing of daily choral services is only a part-time occupation. In the cathedrals the position has become acutely difficult. Office hours do not fit themselves into the times of cathedral services. The problem has been solved in some cathedrals by offering the singers teaching posts on the staff of the choir school. There can be no objection to this practice provided the singers are properly qualified. In the collegiate chapels the position has been greatly eased, and the standard of singing greatly improved, by the endowment of choral scholarships and the substitution of choral scholars for lay clerks. A musical schoolboy with a good singing voice and a modicum of educational achievement can, by this means, win for himself a place in the university which he might otherwise have found impossible to obtain. The daily recitation of the offices – the opus Dei – meant not merely the recitation of the central service of Mass, but also the recitation of the choir offices of Mattins, Lauds, Prime, Terce, Sext, None, Vespers and Compline. With the introduction of the Book of Common Prayer, Mass was replaced by Holy Communion, and the choir offices were compressed into Morning Prayer (commonly called Mattins) and Evening Prayer (commonly called Evensong); and the opus was accordingly reduced. Although, generally speaking, the cathedrals have maintained the opus, either in a said or sung form, educational requirements and economic difficulties of our own day have largely compelled a partial, and in some cases complete, abandonment of sung Mattins, and the acceptance of no more than a spasmodic sung celebration of the Holy Communion. The singing of the opus has therefore been reduced to, and is commonly identified with, daily choral Evensong with the addition of occasional choral Mattins and Holy Communion on Sundays and Saints’ Days. 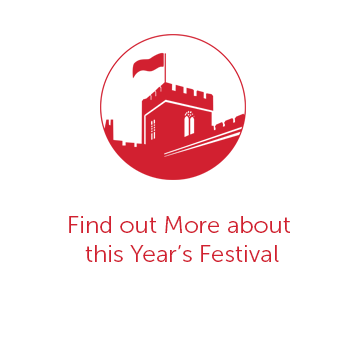 The Festival aims not only to put a choral celebration of the Holy Communion at the forefront of its work, and to give due emphasis to service of Evensong, but also to re-introduce the choral observance of Compline, and to introduce an entirely new form of service, founded on ancient precedent, but designed to meet the needs of our own times. Compline was re-introduced into the liturgy of the Church of England in the Prayer Book, as proposed in 1928, as ‘A late evening service’. It is possible that the singing of this service during the Festival will be the first occasion on which the service has been sung by a full choir (which includes boys) since the Reformation. Evensong needs no comment, save with regard to the opening ‘antiphon’, for which no provision is made in the Book of Common Prayer. Antiphon means anthem. The Preface to the Book explains that ‘It hath been the wisdom of the Church of England, ever since the first compiling of her publick Liturgy, to keep the mean between the two extremes, of too much stiffness in refusing, and of too much easiness in admitting any variation from it’. Minor variations from the prescribed form of service are, therefore, for good cause, within the spirit of the Book and the wisdom of the Church. Where, therefore, an emphasis is placed on the musical aspect of the services, as it is during the Festival, the singing of a short and simple anthem is good cause for minor variation. The Procession is the biggest liturgical adventure which the Festival has yet seen. Bishop Colin Dunlop, in his Dissertation on Processions wrote thus: ‘We are living at a time of liturgical experiment. Few church-goers are really satisfied with the services they attend. Many parsons are conscious that the Book of Common Prayer, even in its revised form, will not alone meet the real needs of their people. Something is needed in addition to the regular Prayer Book services. These we hope will continue to be the core of our public worship; it would be a disaster if they were lost. But it is equally certain that hymn books alone do not form an adequate supplement to the Prayer Book. Further development is needed, if public worship is to hold the attention and affection of people today and to become a real channel for their legitimate aspirations.’ The aim of the bishop’s Dissertation was ‘to try to reconstruct the Procession as a liturgical means of leading modern congregations into a more ready understanding of the Christian faith’. This service in the Festival has been designed to further his aim. On many of the major church festivals, the medieval office of Mattins included three Nocturns. Each Nocturn included three lessons and anthems. The texts of the lessons and anthems were commonly drawn from the prophets, the fathers of the church, and the gospels, and were chosen in such a way as to illuminate the particular festival. Archbishop Benson revived the Christmas service in the form of a Festival of Nine Lessons and Carols. So popular has this service become that it has been followed by revivals of the Advent and Epiphany services. The Procession at Edington has been designed to illuminate the Life of Christ as portrayed in the Christian Year. Thus nine of the events in the Life of Christ which are commemorated in the Church’s Year are linked to nine of the major festivals of the Church’s Year, and they are all woven into one service. The festivals are devided into three groups of three: The Annunciation of the Blessed Virgin Mary (with which Advent is linked), Christmas and Epiphany; Maundy Thursday, Good Friday and Easter Even; and Easter, Ascension and Whitsun. Each group is separated by the moving of the clergy and choir processions to make stations first in the nave, then at the crossing and finally in the chancel. In moving from west to east the processions are symbolic of the moving of God’s people from darkness to light. A word should be added about the lawfulness of the Procession. Though a minor variation from the prescribed form of service may be unobjectionable, the introduction of an entirely new form of service without lawful authority would be contrary to the spirit of the Book of Common Prayer and to the doctrine of the Church of England. 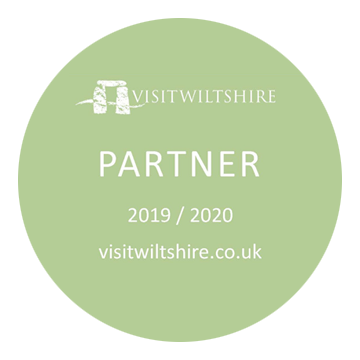 The permission of the Bishop of Salisbury for the use of the Procession at Edington during the Festival has therefore been sought and given. The Solemn Eucharist follows the prescribed form for the celebration of the Holy Communion. It has now, however, become a common practice in the church for hymns to be sung at the beginning of the service, between the epistle and gospel, at the offertory, and at the communion. This practice is, however, no more than a revival of the medieval form of service, in which music was directed to be sung at each of these stages of the service. They were described, respectively, as Introit, Gradual, Offertory and Communion. In the celebration during the Festival the texts which were prescribed in the medieval church for use on the Feast of the Annunciation of the Blessed Virgin Mary have been revived. In choosing texts in honour of the Virgin, the Edington custom has been continued, whereby, in the course of several years, the events of the Virgin’s life which are commemorated in the major festivals of the Church’s Year are remembered in a church which is dedicated to her honour. These texts, together with the Kyrie, Creed, Sanctus, Agnus Dei and Gloria will be sung in Latin. The reason for this is that the music was originally composed for the Latin texts: to sing an English translation of the Latin would be to destroy much of the beauty of the music. So that the texts may be understood, a translation has been printed at the end of this Companion. The music has been chosen in such a way that as many different schools and styles of composition are represented as possible, and with such emphasis as is appropriate to their importance. Compline is devoted entirely to music in use before the Reformation. Each of the several services of Evensong is designed to include not only one item from each school of composition, but also an antiphon, setting of the canticles, anthem, hymn and voluntary from one particular school. This arrangement not only preserves a characteristic feature of the English Cathedral Service, whereby one is shuttle-cocked to and fro between the centuries, but is also faintly suggestive of the ancient distinction between the ordinary and proper of a service. Thus, on one hand, the office hymn ‘To thee before the close of day’ (by Thomas Tallis) is taken from the pre-Reformation school of composition, the preces and responses (by William Smith and William Byrd) and the Lord’s Prayer (by John Farmer) from the school following the Reformation, and the psalm chants from the various schools since the Restoration of the Monarchy. On the other hand, the settings for Tuesday are all taken from post-Reformation period, for Wednesday from the Restoration and Georgian periods, for Thursday from the Victorian, Edwardian and Neo-Georgian periods, and for Friday from our own period. The Procession is designed to include contrasting music characteristic of the various festivals. Thus three medieval carols have been chosen for the Annunciation, Christmas and Epiphany, polyphonic settings of Latin words for the Passion group, and three modern anthems for Easter, Ascension and Whitsun. The Solemn Eucharist is devoted to the music of the greatest of all composers for the English liturgy, William Byrd. Plainsong was for many centuries the basic song of the Church. It was replaced, on occasion, by polyphonic settings of particular parts of the liturgy. It is a pity that that is not the position today. The opening service of the Festival is designed to show how effective, musically, this combination can be. The whole of the service is sung to plainsong with the exception of the hymn ‘Christe, qui lux es et dies’, which is sung to the third of five polyphonic settings of this hymn by Robert White (d.1574). The odd verses of the hymn are sung to plainsong, the even verses in polyphony. In the even verses the plainsong melody appears in long notes in the treble part. The Reformation swept away the elaborate Latin forms of service and substituted a simple English form. It is fortunate that the royal injunctions which prohibited the use of all but the simplest forms of music in church were not enforced for long. The Elizabethan flowering of the arts did not by-pass cathedral music. William Byrd (1543-1623), Thomas Tomkins (1572-1656), Thomas Weelkes (1574-1623), Thomas Morley (1557-1602), Orlando Gibbons (1583-1625) and a host of their contemporaries, endowed English cathedrals with a musical heritage which has never been surpassed. Byrd’s ‘Prevent us, 0 Lord’ makes an interesting comparison with Tomkins’ ‘Almighty God, the fountain of all wisdom’. The texts of both are drawn from the Book of Common Prayer and appear next to one another in the collects printed at the end of the Communion Service. Both texts are set almost syllabically; but whereas Byrd treats his text with harmonic simplicity, Tomkins treats his with harmonic complexity and ingenuity. These two compositions represent the full style of composition, in which all the parts are sung by voices. By contrast Gibbons’ setting of the canticles represents the verse style of composition, in which solo verses, accompanied on the organ, alternate with verses for the full choir. The anonymous ‘Fantasia for Double Organ’ is a particularly fine example of the organ music of the day. At the Restoration there was a brief re-flowering of English Cathedral Music. Henry Purcell (1659-1695) and John Blow (1649-1708) and some of their contemporaries made important contributions to the repertory; but with the death of Blow, cathedral music fell into a gradual decline, which was alleviated only by the compositions of Jonathan Battishill (1738-1801). Blow’s ‘Let my prayer come up’ was written for the Coronation of William and Mary in 1689. Daniel Purcell (1660-1717), a younger brother of Henry Purcell, wrote much music, but little of it has survived. His intimate verse service is amongst the finest settings of the evening canticles. Battishill’s ‘0 Lord, look down from heaven’, with words chosen, unusually for that time, from the Book of Isaiah, is worthy of a place amongst the finest compositions in the whole of the cathedral repertory. These compositions, taken together, make an interesting comparison with their counterparts in the service on the previous evening. John Stanley (1713-1786), whose ‘Voluntary’ has been included at the end of the service, was the most distinguished English composer for the organ during the eighteenth century. The Accession of Queen Victoria, in 1837, marks a decided epoch in the history of English Cathedral Music. The influence of the great European composers of the day, the foundation of the Oxford Movement and the introduction of cheaper methods of printing music combined to cause an enormous increase in the output of cathedral music. ‘I saw the Lord’ by Sir John Stainer (1840-1901) is one of the best anthems of the mid-Victorian period. It contains powerful harmonic writing which is both daring and effective. It is a pity that the final section, which is also the longest, lapses into insipidity. The late Victorian and Edwardian periods saw a remarkable revival of cathedral music under the leadership of Parry (1848-1918) and Stanford (1852-1924). The setting of the evening canticles for double choir by E. W. Naylor (1867-1934), which dates from 1903, is remarkable not only for its forthright chordal writing but also for its employment of the plainsong melody tonus peregrinus – a direct acknowledgement of the heritage of the past. The Neo-Georgian period saw a continuation of the revival of cathedral music, noticeably in the works of Charles Wood (1866-1926). The setting by Sir Edward Bairstow (1874-1946) of St. Bernard’s hymn ‘Jesu, the very thought of thee’, which dates from 1925, is a good if modest example of the distinguished craftsmanship of the late organist of York Minster. Stanford’s Postlude in G minor (Op. 101) is taken from the first of two sets of Six Short Preludes and Postludes for Organ. The composition by Dr. Herbert Howells (b.1892) of the evening canticles ‘Collegium Regale’ in 1945 marks the beginning of a new phase in the composition of cathedral music. For the first time a glimpse of the modern harmonic idiom is seen in a liturgical setting of the canticles. This setting was written, as was the setting by E. W. Naylor, for the choir of King’s College, Cambridge. ‘Bring us, 0 Lord God’ by Dr. W. H. Harris (b.1883), the organist of St. George’s Chapel, Windsor, is a masterly setting of John Donne’s words. Set in the key of D flat for double choir, it inevitably invites comparison with his setting of Edmund Spencer’s poem ‘Faire is the Heaven’. During the last year Philip Radcliffe (b.1905) has set the well-known words from the Sarum Primer of 1558, ‘God be in my head’, for performance at this year’s Festival. He has solved, by an ingenious use of an eight-part choir and by a sensitive adjustment of harmonic tensions, the problem of writing a satisfying piece of very short duration. Herbert Howells’ Psalm Prelude (Op. 32, No. 1) is one of his many highly effective compositions for the organ. The music of the medieval church was not solely confined to plainsong and to polyphony derived from plainsong. Carols – which, to justify the name, must contain a recurring refrain (or ‘burden’) were introduced as an ornament to the ceremony of the Church. Although carols were not the exclusive perquisite of Christmas, most of them were associated with the Festival of Christmas. It was therefore felt that carols were appropriate to the first group of festivals represented in the Procession. ‘Nova, nova’ is a dialogue between the Angel Gabriel and the Blessed Virgin Mary, and is set for boys’ voices. ‘Lullay, lullow’ is a typical cradleside carol set for divided altos. ‘Illuminare Jerusalem’, tells of the visit of the three kings to Bethlehem – a story which has long been associated with the message of the Epiphany – and is set, appropriately, for three male voices. Although the Reformation swept away the medieval forms of service, several composers, no doubt at their peril, continued to write for the Latin rite; and these compositions represent the fullest flowering of the cathedral music of the English Renaissance. White’s setting of the Lamentations of Jeremiah for five voices is an example. It has been suggested that in setting these words he was expressing his personal lamentation at the passing of the medieval church. The refrain ‘Jerusalem, Jerusalem, convertare ad Dominum’ might well have been White’s personal appeal to those in authority to come to their senses before all was lost. In the Vulgate, the successive verses of each chapter of the Lamentations are prefixed by a successive letter of the Hebrew alphabet. In the liturgy of the church this prefixed letter was, curiously, set to plainsong. White, in setting the prefixed letter, merely continued the tradition. Whereas the composers of the sixteenth century excelled chiefly in setting sad words, modem composers have excelled chiefly with cheerful words. The settings by Armstrong Gibbs (1889-1960) of Edmund Spencer’s poem ‘Easter’ (‘Most glorious Lord of Life’), by Arthur Hutchings of Miles Coverdale’s translation of the psalm ‘God is gone up with a merry noise’, and by Vaughan Williams (1872-1958) of Coverdale’s Whitsunday Hymn (‘Come, holy spirit, most blessed Lord’) each display not only a characteristic choice of a fine text, but also a remarkably keen sense for effective choral writing. The inclusion of Bach’s organ music is the one exception to the principle of the Festival whereby the music is selected from the works of English composers. J. S. Bach (1685-1750), who is regarded by many as the greatest composer of all time, is undoubtedly the greatest composer for the organ who has ever lived. Although the range of his compositions in this medium is wide, only his chorale preludes have been chosen for inclusion in this Festival. These compositions, however, which consist of a short treatment of a congregational hymn, account for very nearly half of the total sum of his organ music. Before Evensong each day one of the six Schübler Preludes will be played. These derive their name from the engraver to whom they were sent in about 1746. With two exceptions, the chorale preludes to be played during the Procession have been selected from the Orgelbüchlein. This collection, compiled in 1717, contains chorale preludes for the whole of the Church’s Year. The two exceptions are the well-known ‘Nun komm’, der Heiden Heiland’ (BWV659) and the great Fantasia upon ‘Komm, heiliger Geist’ (BWV651) from his Eighteen Chorales, the work upon which he was engaged when he died. William Byrd was another composer, who, like White, continued to write for the Latin rite after the Reformation. His setting of the medieval liturgy for the Feast of the Annunciation of the Blessed Virgin Mary is without doubt amongst his finest compositions. It is, as yet, little realized that Byrd intended his settings of the ordinary of the mass to be used at the same time as, and in conjunction with his settings of the proper. In his two volumes of ‘Gradualia’, published in 1605 and 1607, Byrd set the propers of all the major church festivals, including, in particular, the Marian festivals. It is a matter of no small interest that copies of his settings of the ordinary are now to be found bound up with the ‘Gradualia’. This music, which is only to be heard rarely in any surroundings, has almost certainly never been sung liturgically since the time it was written. In concert performance the stem stylistic unity of this entire setting might induce monotony. Heard in its rightful liturgical context, Byrd’s music brings a splendour and power to the Eucharist such as one could expect to experience rarely outside monastic walls. In 1351 William of Edington, Bishop of Winchester and Chancellor of England, founded a college of chantry priests in Edington. A few years later he converted the college into a Bonshommes monastery. To provide the college (and later the monastery) with its own church William of Edington pulled down a Norman church, which stood on the site of the nave of the present church, and built the present church. The present chancel formed the collegiate (or monastic) church, the present nave, the parish church. Building, which began in 1352, continued for nine years. The work, which is believed to have been carried out, under the supervision of William of Wykeham, by the masons who had recently transformed the choir of Gloucester Cathedral and who were about to transform the nave of Winchester Cathedral, illustrates more clearly than any other church in the country the transition from the Decorated to the Perpendicular styles of architecture. The completed church was consecrated by Robert Wyville, Bishop of Salisbury, in July 1361. The main fabric of the church has remained largely unaltered, and is now the only perfect example of a monastic church in Wiltshire. Contemporary with the building of the church is the stone ornament in chancel and transepts and the stained glass in the north clerestory and north transept. The portrait of St William of York, in the north clerestory, is amongst the finest stained glass in England. Little is yet known about the Order of Bonshommes. The first house had been founded at Ashridge in Hertfordshire some seventy years earlier; and Edington appears to have been the second and last foundation. The statutes provided for a rector and brethren who were to follow the Rule of St Augustine. The monastery flourished until the Dissolution. Monastic peace was, however, rudely interrupted at the time of Jack Cade’s rebellion. William Ayscough, Bishop of Salisbury, was dragged from the high altar, where he was celebrating mass, and was murdered on a nearby hill. Enrichments of the church during the monastic period include the chantry tomb of Sir Ralph Cheyney (between the southern piers of the nave), the canopied tomb of one of the brethren (in the south transept) and the double wooden screen (or ‘pulpitum’). During the seventeenth century the church underwent its first restoration. It is therefore fitting that the Lewis family should be commemorated by the fine tomb which stands against the south wall of the chancel. The pink and white plaster ceiling, the curiously inconvenient altar rail in the chancel, the pulpit and tester, the font cover and the Lady Chapel reredos all date from this period.